A row has broken out between Russia's controversial culture minister and the family of the great composer Sergei Rachmaninoff, who died in exile in the United States in 1943. Vladimir Medinsky wants the remains of the Russian-born maestro to be reburied in a lavish mausoleum on the country estate that he fled at the height of the 1917 revolution, the Dni website reports. Russia has proposed the reburial before, but Medinsky this time included a broadside against the United States, which he accuses of neglecting the composer's grave, trying to "shamelessly privatise Rachmaninoff's name" and denying his Russian roots. But the composer's great-great-granddaughter, Susan Wanamaker, says Rachmaninoff's final wish was to lie alongside his family in a New York State cemetery. "We have no plans to go against his wishes so he will remain there," she told the BBC. "There is and there should be absolutely no confusion." One Russian culture critic tells AFP that the minister's comments are more about politics than music. "Without question, this is a political need for yet another patriotic spectacle, for a sad yet triumphant event to boost the national spirit," he tells the agency. Many Russian social media users mock the minister's idea, likening it to his frequent outbursts against Western culture, modern art and homosexuality. 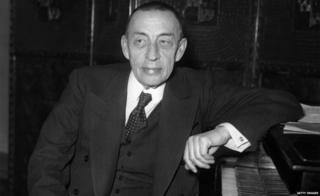 Several people wonder whether Russia deserves to host Rachmaninoff again, given that he fled persecution and his music was banned for decades after he denounced the Stalin regime. "So they drove him out and now nearly 100 years later invite him back," one Twitter user says. "Intellectuals don't worry about ethnography," writes another person on the Ekho Moskvy radio site, noting that "Germany is not demanding the return of Albert Einstein's remains." Another comment is more blunt: "Let's first cleanse our soil of the corpses of the executioners, then we can talk about bringing the remains of their victims home."